Join Australia's most NORTHERN CROCODILE CRUISE during your visit to the top of Australia. Aboard the vessel MV YORK EXPLORER you will enter into one of the most pristine and verdant marine wetland systems in Australia. Here we explore the flora and fauna of its many tributaries and of course sightings of Australias largest crocodile species "The Salty" as we call it them in the north. Your trip to the Cape is normally during the cooler months of the year, a time when crocodile sighting are at there best. Our vessel is also available for group charter or for that special interest cruise. YOU PLAN IT, WE MAKE IT HAPPEN. Enjoy and remember your trip to the top. The Croc Tent is on the road only 17 kilometres from Cape York, the northern-most point of Australia. Get your free map and helpful advice on things to see, and current road conditions. Then browse through the widest range of souvenirs on the Cape to get something to remember the trip by, or send to those who didn't make it! Look at our famous photo board to see how fellow travellers fared on their journey, or just stop and have a chat under the old mango trees. CAPE YORK ICE AND TACKLE. "More than just a tackle shop". Located just past the community of New Mapoon, look for the signs and sails as you head down the hill towards Seisia Wharf. Booking agents for Regional Pacific Airlines,and Peddells Ferry Service. We are authorised NPA Pearl Brokers and have a range of pearls on display. Our stock include camping equipment, hardware, boating equipment, trailer parts, gift ware, souvenirs, local art work, sporting equipment, diving accessories and much more. Hire boats are available and holiday fishing packages to suit everyone. Get to the Top! 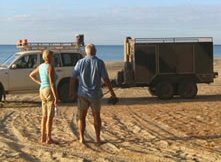 Discover the rich history and cultural diversity of the last frontier with a Loyalty Beach Guided 4WD tour. Experience the true Cape York in air-conditioned comfort, with guided commentary and lunch provided at a pristine location. Fly-in tours can also be arranged from Cairns or Weipa, or if you're visiting the Torres Straits, why not head across to the Cape for the day via the Peddell's Ferry. These trips into the Australian Outback are primarily journeys of discovery that will take you back in time tens of thousands of years, into areas of Cape York and northern Auatralia where you can experience sights, sounds and scenery that can be found no where else on earth. BEGINNING at the historic settlement of Cooktown, Cape York Peninsular is a vast area of unexplored wilderness, magnificent National Parks, sacred Aboriginal sites, unexplored rain forest, rugged mountains and beautiful wetlands. Cape York is a land of climatic extremes where the creeks run dry or 10 feet high.